There is no easy way to say it: when I was younger, I had a monster unibrow. I was teased so much that I was driven to start plucking the area in fourth grade, an act of fitting in that my mother quickly put a stop to. I could not believe the lie that she was telling me, but I usually chalked it up to the fact that since she was older she didn’t have what 9-10 year old Madeline would call “style” (bell bottoms, a crop top and “The Rachel” haircut). Undeterred by my stubbornness, my mother worked hard to make me like my eyebrows. “You have Brooke Shields eyebrows!” she would say. At that age I had no idea who Brooke Shields was but when I finally saw a picture of her I had to agree with my mom: Brooke and I both had hideous eyebrows. But Brooke was allowed to wear a full face of makeup, and in my eyes, the rainbow of eighties hues sprayed across her face did a lot to redeem the unsightly situation below her forehead. Meanwhile I remained makeup-less with just two shades of color on my face: “inky” (my eyebrows) and “Elmer’s Glue” (my skin). Like a walking black and white photo. 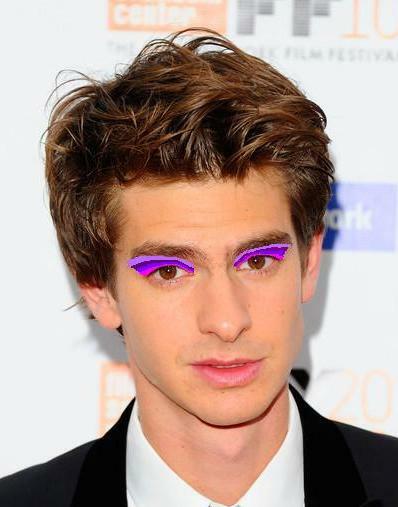 See how the makeup totally takes the focus off of Andrew Garfield’s eyebrows? I guess a small part of me was relieved that a celebrity had similar eyebrows, but it did little to change my mind about how ugly they were. I went to drastic measures in the fifth grade when I attempted to skirt my mom’s “no plucking your eyebrows!” rule by applying Nair to the area in between my eyebrows. The plan worked well; so well, in fact, that in addition to my unibrow I removed a decent amount of skin. That’s right, I gave myself a chemical burn – oh, the price of beauty! My mom must have felt bad for me because the eyebrow plucking prohibition was unofficially repealed. Now my only problem were the two caterpillars above my eyes, a situation that I was too lazy and clueless to do anything about until I was fourteen. At the end of 8th grade, on the night before a very important family event with lots of pictures, my older cousin dragged me into the bathroom and plucked my eyebrows for me. An hour or so later my face was transformed – the extreme thinness and noticeable “groomed look” of my new brows made me feel older and sophisticated. The dozens of pictures from the event, however, serve as historical records of the truth: I had a great time that day and there were sperm-shaped patches of hair above my eyes. Thankfully, their shape has gradually improved over the years and just like my mom said, I’ve grown to really like my eyebrows. I even get the occasional compliment on them, almost always prefaced with “this is going to sound weird but…” and said with the same hesitation as with a compliment to someone’s elbow or knee. So I just want to say this once and for all: my eyebrows and potential unibrow couldn’t grow faster if I applied Rogaine to the area every night. I spend a lot of time weed wacking these things so FEEL FREE to commend me for it. I will happily accept each compliment because even though it’s completely superficial, the validation that I no longer look like Frida Kahlo is still nice to hear. Give me a month though… it’s all the time my unibrow would need to come back with a vengeance.